Gee, it’s a been a while since I updated hasn’t it? Truth be told, I’ve spent most of my crafty time on Project Life (which I blog about here) and hadn’t sewn for months and months. 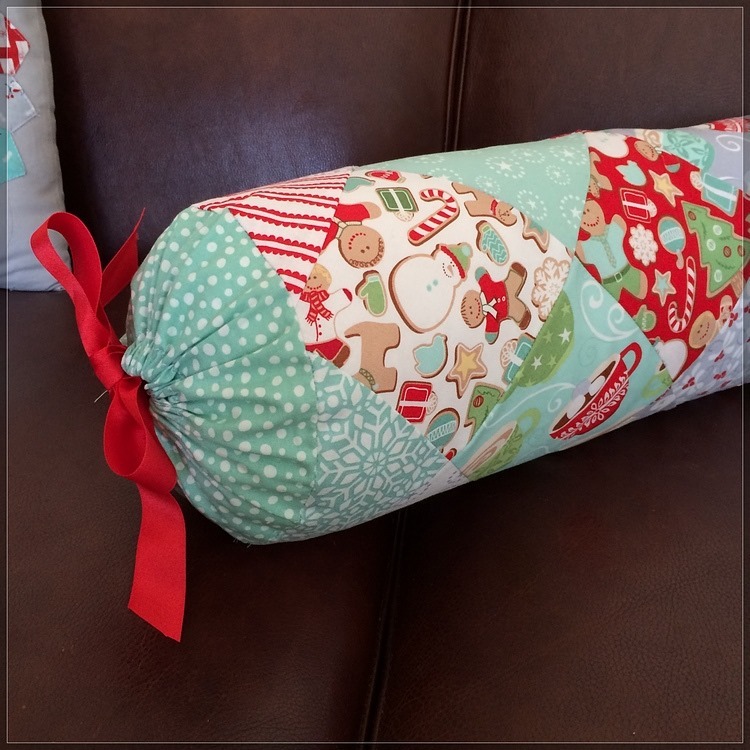 I purchased Christmas fabric back in July, and really should have followed through on the urge to sew and sew then, as I really wanted to use up my Christmas stash, but left it far too late. First up I made a cover for a bolster insert. I used Noodlehead’s tutorial, just adding more squares to make it big enough and changing the way it closed. I used Kate Spain’s In From the Cold line and am very pleased with the result. Next up is a matching cushion using the same like. The bigger pieces came from a panel that was supposed to make placemats or a runner, but I didn’t really need placemats, and had other fabric for a runner, so I used some here. Photographed rather poorly we have a pair of stockings whipped up from the In from the Cold stocking panel. I really like the patchwork one, but the other is a bit plain. I may embellish it this Christmas. 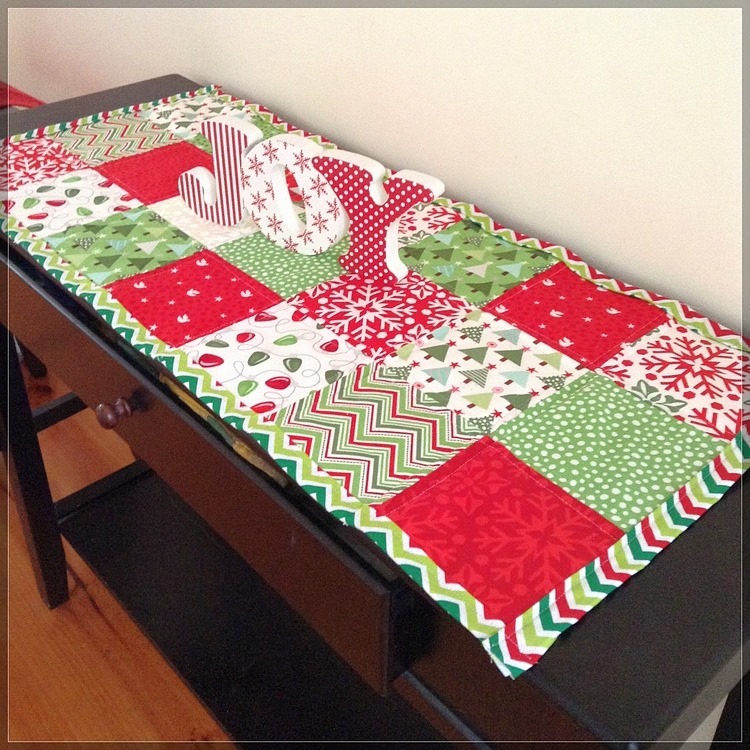 Lastly we have a runner for the hall table made using charm squares from Kate Spain’s ‘Joy’ collection. I threw this together really quickly, but it’s my favourite of all the things I made. I really brightens up the hall. 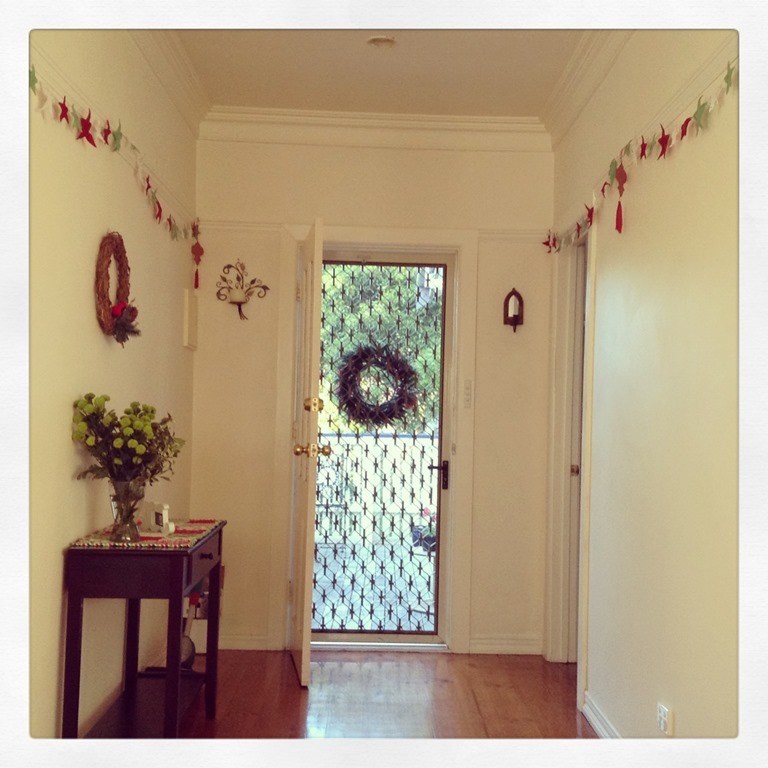 It matches my star garlands (below) perfectly which I didn’t realise until I put it in place. Hopefully I’ll have more sewing to share soon. I keep seeing the economy block along on Instagram (#economyblockalong in case you’d like to join in too) and I’m quite keen to make some economy blocks to use up stash. Oh my! I missed this comment. Thank you so much for taking the time to comment. 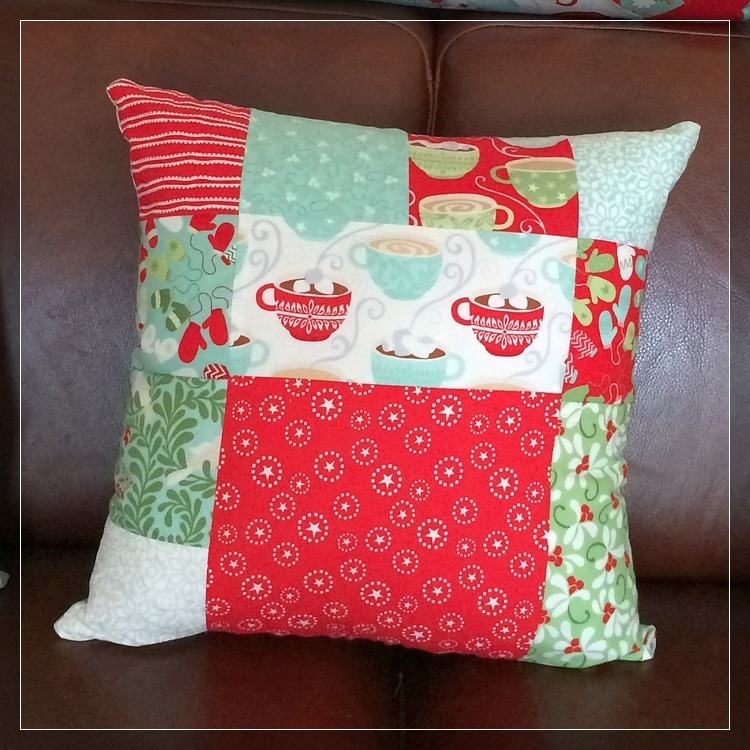 I really love ‘In from the Cold’ and have plenty left to make more things for this Christmas! The Christmas seeing looks great! 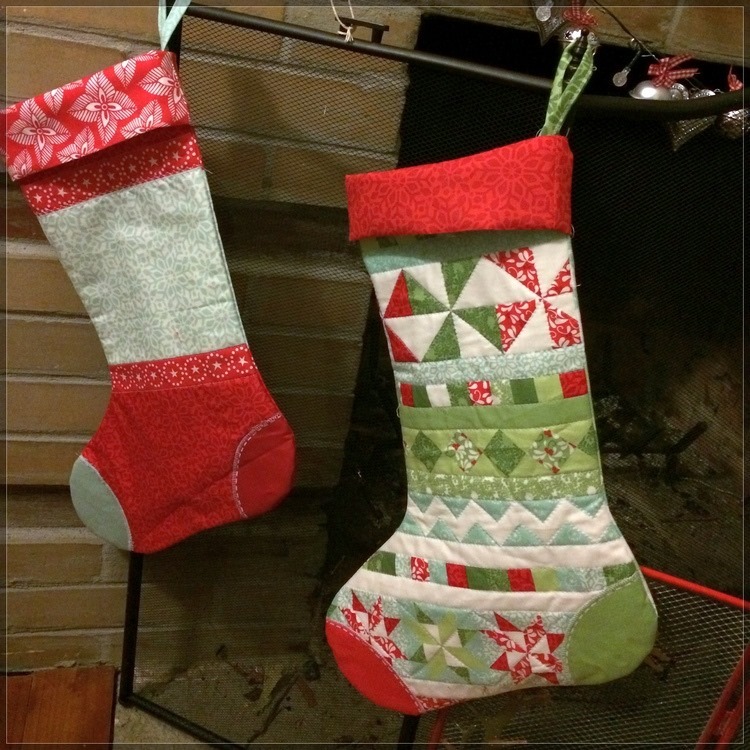 I really love the patchwork stocking-it’s gorgeous.